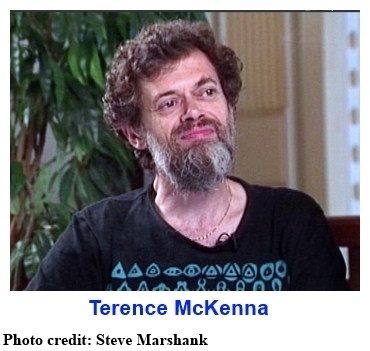 Posted in Ayahuasca, Consciousness, Culture, Psychedelics, Shamanism, Terence McKenna (mp3). Oops, looks like my previous comment is a year late, as Auden already pointed out the word mix-up. All in all, I really enjoy the salon! Thanks so much! “Lack of brevity is proof of psychosis”. Thank you, Lorenzo, as always, for your grand work spreading well worthwhile psychedelic logos! Thank you also for pointing out the fact that there is a strong trend toward islamophobia in the West today. It reminds me somewhat of the general hostility towards religion, spirituality and with it: all thinking which doesn’t conform to the box of mainstream science, expressed in rhetorical attacks perpetrated by the likes of our brothers Bennet and Dawkins. It’s a hype that claims to have everything to do with critical thinking, whereas in fact, it has everything to do with hate mongering. It breaks my heart and I’m sick of it. At the end you mentioned something about listening to Terence’s factual claims with a critical ear, and I do agree with you. As great and transformative as his logos is, it is not revelation nor guaranteed truth. Regarding the “cold water infusion”-business, he says at around 49 minutes: “…this plant [banisteriopsis caapi] is boiled or sometimes merely used in a cold water infusion, almost always in combination with one other plant, to produce a beverage that is, if made properly, extremely hallucinogenic…” In my mind he qualifies his statement when he says “if made properly”, and he may still be right that cold water infusions containing the vine are also sometimes prepared, however they would not be among those brews that are “prepared properly”. Earlier on, at around 36 minutes into the podcast, is where I reacted to when he claimed that “Ontos is knowing, and ontology is how we know…” I am sure most will agree that these words refer to being, and Terence must be confusing it with “episteme” and epistemology. In other talks I have heard by him, he gets these terms straight and says very clever things about them. Later on, at around 58 minutes, comes the anecdote about St. Thomas of Aquinas who supposedly was the only person in contemporary Europe who could read silently. By mere synchronicity the next piece of media that I consumed after this podcast was an episode of (Dawkins-friendly) Stephen Fry’s QI-quiz show, and the very same anecdote came up (at about 21 minutes https://www.youtube.com/watch?v=5ZDuJTcMeoo), only it wasn’t St. Thomas, but St. Ambrose who lived around 900 years earlier, who was famously mentioned by St. Augustine for his ability to read without making a sound nor moving his lips. Then I read something about it here as well: http://www.catholicherald.co.uk/commentandblogs/2011/12/08/st-ambrose-the-man-who-invented-silent-reading/ and there is a very interesting comment by James M which talks about other and much earlier cases of silent reading that have been reported throughout history. Not that any of this changes Terence’s point: Language is highly programmable, and the human brain is highly malleable.